Suddenly, it’s September, and everywhere I look, there are hints of a changing season. One of the first autumnal signs I’ve noticed this year is the appearance of fuzzy, colorful, and boldly-patterned Tussock Moth caterpillars. Although these hungry little critters do tend to skeletonize the foliage of certain trees, and sometimes, during large infestations, they can cause trouble with crop trees, their late-season noshing is usually a minor aesthetic issue, (Hickory Tussocks mainly munch deciduous elm, ash, oak, willow, nut and of course, hickory trees, while White-Marked Tussocks and Definite Tussock Moths, usually prefer apple, birch, elm, maple, cherry and sometimes conifers such as balsam fir and larch). 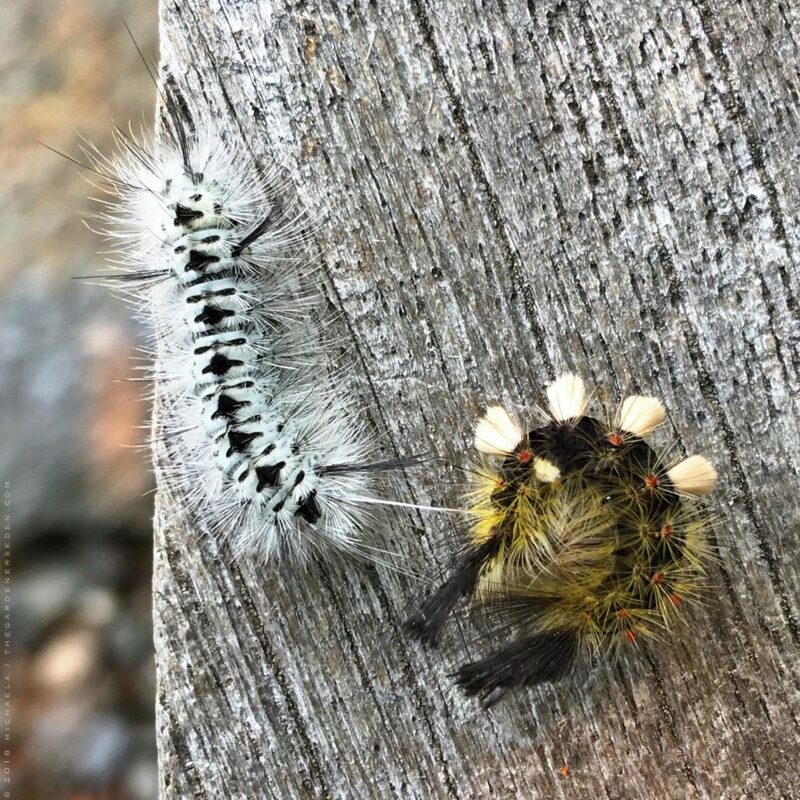 However, the black and white, Hickory Tussock Moth Caterpillar (Lophocampa caryae, pictured atop, at left), has recently caught some bad press as a “venomous caterpillar”. So, what’s the scoop? 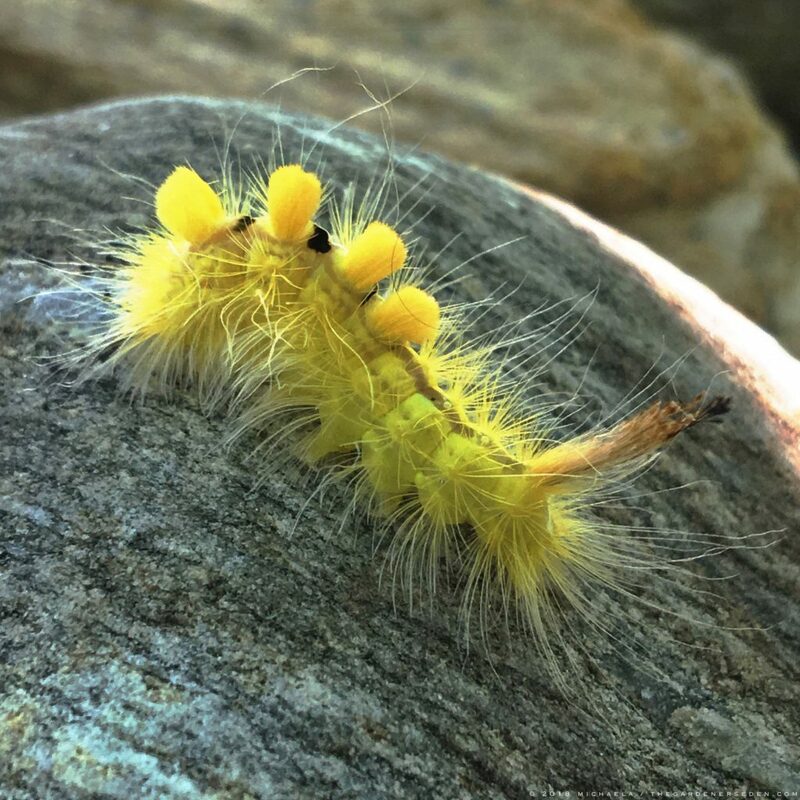 The Definite Tussock Moth (Orgyia definita), is Easy to ID with its Yellow Head and Body, Black spots and White-Blond Hairs. 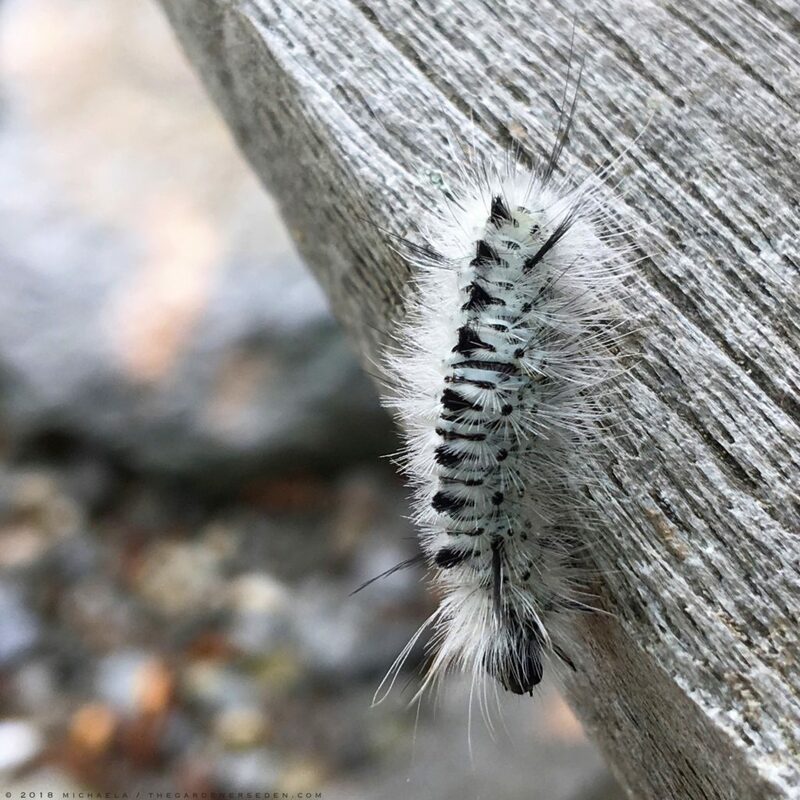 Indeed, the spines of many Tussocks –including, but not limited to the black and white, Hickory Tussock Moth Caterpillar— do contain a venom to ward off predators. When handled, this venom can rub off on the skin, sometimes causing a red, stinging, itchy rash. For most people, the reaction is mild, and can be treated with ice and over-the-counter rash medication, however some individuals –particularly children and adults with sensitive skin– will experience more discomfort than others. For this reason, it’s best to avoid handling all Tussock Moth Caterpillars, unless wearing gloves. Most wild creatures do prefer to be left alone, so I try to simply observe and enjoy insects, and all other wild things, from a respectful distance, without touching or disturbing them at all. For more information about Tussock Moths and their Caterpillars, visit BugGuide.net or MothAndCaterpillars.org. Look, But Don’t Touch! Some People Experience Allergic Reaction to Tussock Moth Caterpillar Venom. Avoiding Contact is the Best Defense. Most Creatures Prefer Not to be Handled Anyway. You are currently browsing entries tagged with White-Marked Tussock Moth at The Gardener's Eden.